You should be redirected automatically in a few moments, but if not, please click here to see if Maps for Local History Research (part 2: Old Maps) has made the transition. In this, the second of two posts on maps of Liverpool, I want to point you in the direction of a load of maps from before the Ordnance Survey was established. Although the OS maps chart the most significant changed in Liverpool’s history, in terms of the amount of change to the city, older maps often are unique. They show details or aspects which no other map does, and can often show what was important to the map-maker. Modern maps are often much more ‘objective’ in comparison. But for this reason the old maps are of use to the local historian, and at the same time can be quite beautiful objects too. If you know of any others I’ve missed out, or other places where these maps are available, let us know in the comments! William Ashton included a simple sketch of Liverpool in its early history in his book ‘Evolution of a Coastline’ in 1920. The sketch map of Liverpool in the 17th century is reproduced on the Mapsorama web site. Ashton’s top-down plan of Liverpool is also on Mapsorama. The book itself has recently been reprinted, so if you want a higher resolution copy you can pick up ‘Evolution of a Coastline‘ at Amazon. Genmaps is a map site hosted by Rootsweb (part of Ancestry.com), and has a page on Lancashire maps. There’s a huge range, so I’ve collected the Liverpool entries in the following table. If you’re reading this in the dim and distant future, I recommend going to the original page, hitting Ctrl+F on your keyboard and searching for ‘liverpool’ to catch newer uploads. Plan of the Liverpool Docks 1846 Jesse Hartley (Dock Surveyor) engr. C.B. Graham, Washington, D.C.
Liverpool Docks ca.1860 J.Bartholomew for R. Fullarton. Liverpool (Eastern Section) 1885 Report of the Boundary Commissioners for England and Wales. There’s a link through to a higher resolution version. Liverpool (Western Section) 1885 Report of the Boundary Commissioners for England and Wales. Liverpool 1897 Century Atlas Company. (detail from map of England and Wales) Quite a tiny map! Liverpool 1898 Meyer in German lexikon Brockhaus. Published by Leipzig Bibliographisches Institut. Some of them are high resolution, and some not. Others have links to higher resolution versions of extracts below them. Lancashire County Council has what I consider to be the best collection of old maps for any student of Liverpool history (or of course, any Lancashire history). It runs from a reproduction of Gough’s 1320 map, through all the major mapmakers: Speed, Yates, Greenwood, Hennet. Greenwood, 1818, is undoubtedly the best! Click on the exact point you’re interested in, as these maps have been cut up into sections when added to the site. It will take a fuller post to go into the kind of detail you can glean from these maps, but suffice to say that these objects can be both beautiful as well as useful. As has been mentioned, they often show what was important to the people who drew (or commissioned) the maps. For us today they can provide an immediate visual visit on the past, easy to interpret. For this reason one of my favourites has to be this 1833 Society for the Diffusion of Useful Knowledge map (if only for the name! ), which shows quite a lot of detail, including Bootle Castle at the end of Regent Street, an unfamiliarly station-free Lime Street, and is detailed right out to Kensington (the edge of the city back then). Click on the map to zoom in. Finally, I want to mention a map I only saw for the first time recently, in the modern edition of The Calderstones by Ron Cowell. It’s a map made in 1568 to help solve a boundary dispute between Allerton and Wavertree. It’s a very beautiful map, but not only does it show the Calderstones, but also the mysterious Rodgerstone (a prehistoric standing stone) and the Pikeloo Hill (possibly a burial mound). 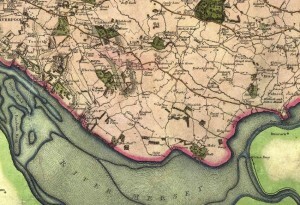 Not only do we have possibly the oldest map of the Liverpool area (do correct me if I’m wrong!) but a tantalising glimpse of a prehistoric complex now long lost. I can’t find a copy of this map online, so if anyone has a high resolution scan, do get in touch. I can’t get to the Record Office personally, and if there’s a way of ordering copies to be sent to you, the details are less than forthcoming. Well, that rounds off this brief excursion into Liverpool maps. There are certainly some I’ve missed, but do air your own views on these sources in the comments! Image: Extract from the Greenwood map of Lancashire, 1818, available in full on the Lancashire County Council Old Maps of Lancashire website.